I am a self-proclaimed bread fanatic. I enjoy it in all of its forms, but my most favorite kinds of bread are of the sweet breakfast variety. This loaf really delivers. It is sturdy enough for toasting, light enough to eat on its own, and perfect for Vegan French Toast. 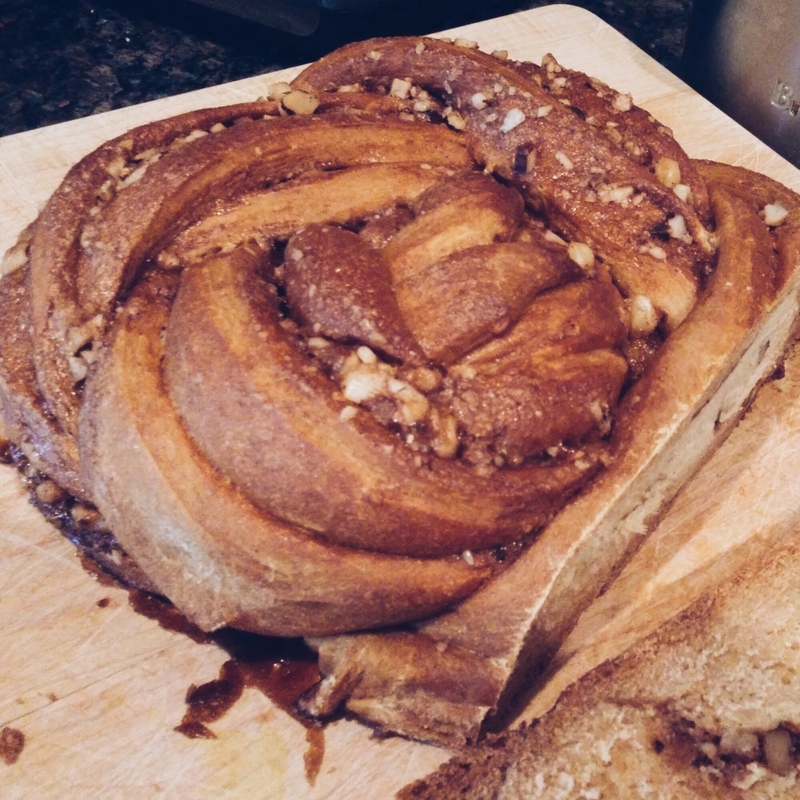 With a sticky, cinnamon and walnut swirl, what’s not to love? While the yeast is resting, mix the flour and salt together is a small bowl. The binding ingredients (oil, water and baking powder) give the bread a fluffier consistency. Whisk them together and then add to the yeast mixture. Add the flour and salt one cup at a time. If you are working by hand, once the dough becomes too difficult to mix, turn it out on to a lightly floured surface and knead in the remaining flour. Continue to knead for approximately 10 minutes. The dough should be pliant and smooth, not sticky, with a springy elasticity. Less flour is better, so use your discretion. Transfer the dough to an oiled bowl and cover it with a damp towel. Set it in a warm place for 90 minutes or until it doubles in size. While the dough is rising, mix together the chopped walnuts, cinnamon, maple syrup (or sugar paste), and flour. Once risen, roll the dough out to a large rectangular shape about 1/2 in thick. Spread the filling over the dough so that it is completely covered, then roll the dough length wise. This will create the swirl. If you want a rectangular loaf, place swirled dough in a large oiled loaf pan (or cut in half and place in two smaller loaf pans). For a round loaf, slice the rolled dough in half lengthwise, essentially splitting it in half. Twist the two halves together to make a rope. Then wrap the dough rope into a spiral shape, tucking the end under so it doesn’t come undone. Place it on a parchment paper lined baking pan. Don’t worry so much about the look, as the twisting is mostly to get the delicious cinnamon swirl effect. Let the dough rise once more for 45 minutes. Bake for approximately 30 minutes or until internal bread temperature is 190 degrees F.
Make sure you add the binding agent directly before the flour to have the light, fluffy effect. Make sure the baking powder is relatively fresh, or the bread may turn out hard.